MouseSteps Weekly Show #35 – Dining: SeaWorld, Epcot’s Germany Pavilion Biergarten, Disney’s Fort Wilderness Trails End Buffett, New Years Eve Fireworks at Disney’s Polynesian Resort! 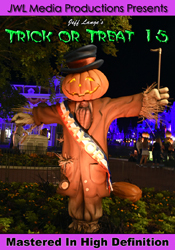 In Mousesteps Weekly #35, we talk about a whole lot of food! 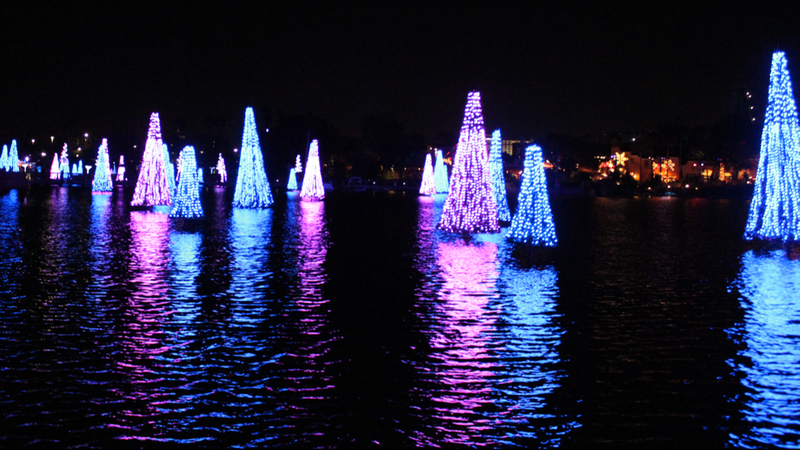 We cover: The SeaWorld All-You-Can Eat Dining Deal, which we tried during Christmas week! 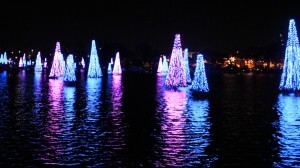 We also share some of the Christmas decorations and activities around the park, including the Sea of Trees, Winter Wonderland on Ice skating show and the fireworks finale. 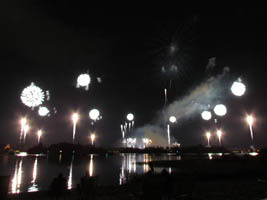 Continue reading MouseSteps Weekly Show #35 – Dining: SeaWorld, Epcot’s Germany Pavilion Biergarten, Disney’s Fort Wilderness Trails End Buffett, New Years Eve Fireworks at Disney’s Polynesian Resort! 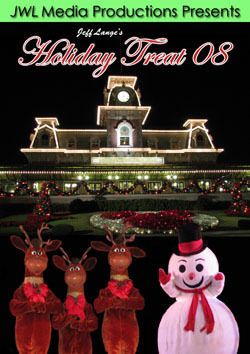 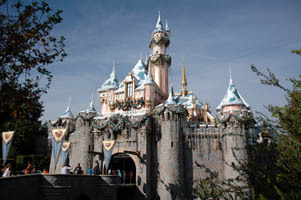 Some "After-Christmas" Gingerbread – Polynesian Torch Lighting Returns – Latest DVD Release "Disneyland Holiday Treat 08"
I hope you all had a wonderful holiday and are recovering nicely. 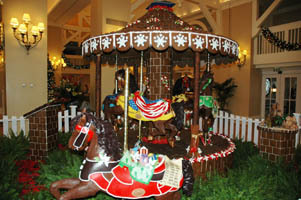 Today I present some “after-Christmas” gingerbread from around the Walt Disney World resort! 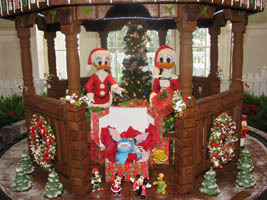 Donald and Daisy Duck are residing at the Boardwalk Resort. 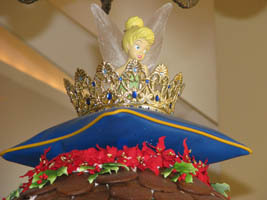 The carousel below is from the Beach Club, Tinkerbell sits atop of it! 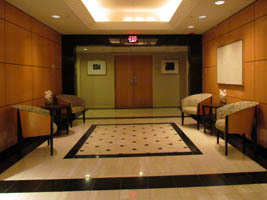 You will find her below. 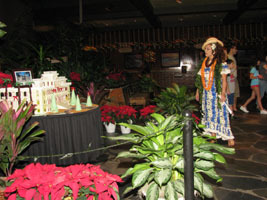 On the lower right, one of the employee-led gingerbread houses inside the Polynesian Resort. 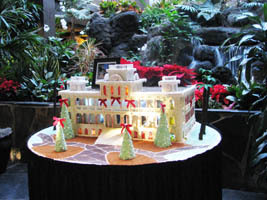 Instead of just one gingerbread display, they have many. 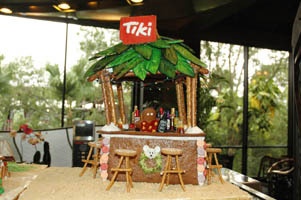 Some are done by chefs, but others are a team effort from a variety of areas at the resort. 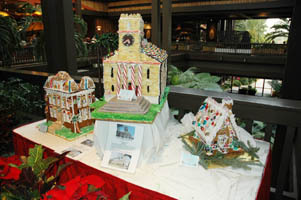 Below on the left is the main gingerbread display in the lobby. 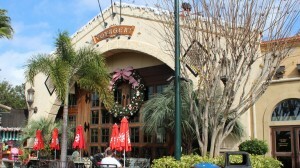 All others are on the 2nd floor, including the Tiki bar which is one of two that are at the sushi bar. 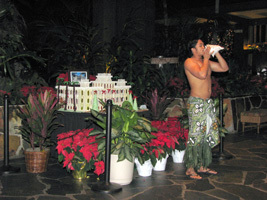 The Polynesian has some wonderful displays, including one of an air hangar with moving propellers! 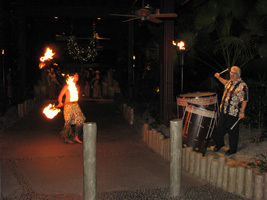 Frequent contributor and site partner Denise from MouseSteps was at the first Polynesian Torch Lighting Ceremony tonight since it was stopped a few weeks ago due to Kaleo leaving. 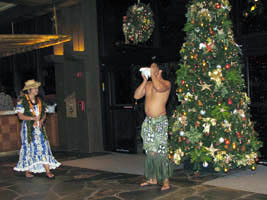 The ceremony was hosted this evening by Lipoa, who entertains at “Ohana. 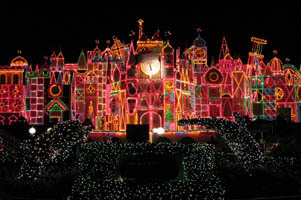 This all-new JeffLangeDVD title features the following magical experiences from the holidays at Disneyland: “A Christmas Fantasy Parade”, Sleeping Beauty’s Winter Castle Lighting, “Haunted Mansion Holiday”, “it’s a small world holiday”, Believe… In Holiday Magic” fireworks and much more! 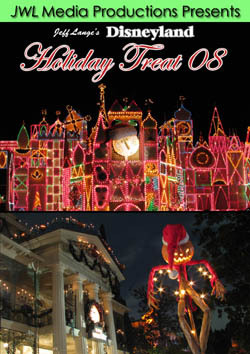 Jeff Lange’s Holiday Treat 06, Jeff Lange’s Holiday Treat 07 and Jeff Lange’s Holiday Treat 08. 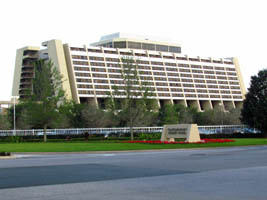 Construction is progressing at the Saratoga Springs Treehouse Villas at Walt Disney World! 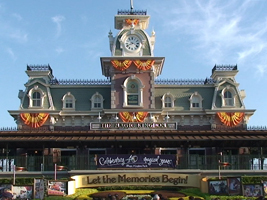 Here is some new video contributed by site partner Mousesteps.com. 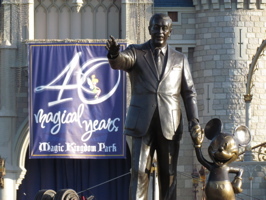 Mousesteps also has some photos of around Fort Wilderness Campground on the new site update! 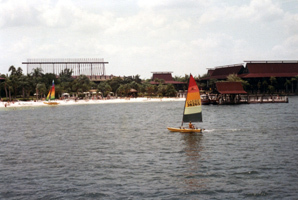 Also today, my friend Jim Hill did a story about the Polynesian Resort featuring some of my vintage photos. 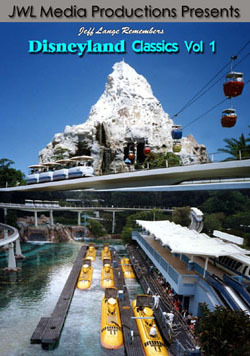 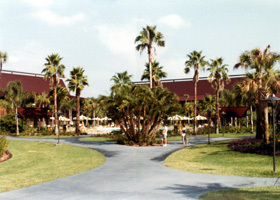 I have always loved the Poly and have so many wonderful childhood memories of staying there! 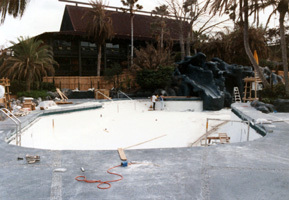 Below I am seen enjoying the themed volcano slide and a rare view of the original pool during a rehab. 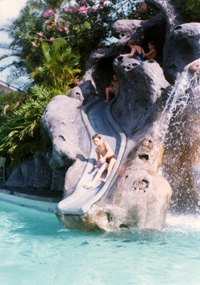 For more of my vintage Polynesian photos please click HERE. 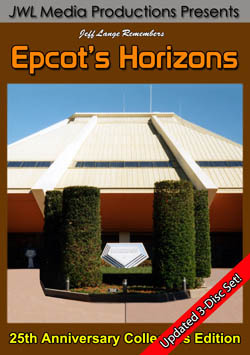 I also have available a Polynesian Resort Screensaver CD and a Polynesian Resort Experiences DVD. 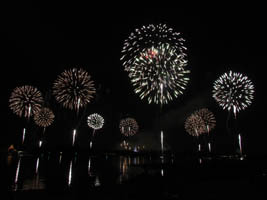 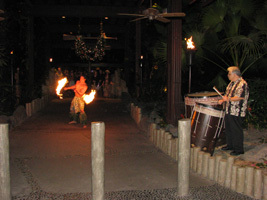 To learn even more about this wonderful resort, I recommend Tikiman’s Polynesian Resort pages. 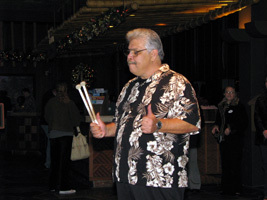 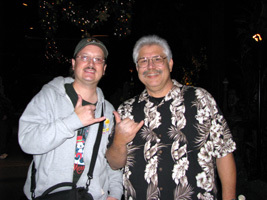 He really does a great job and I learned much I did not know about The Polynesian’s history from his site. 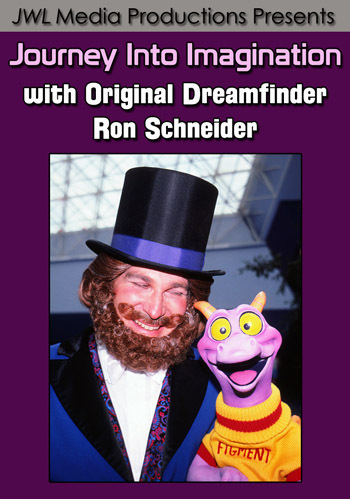 We also have these title available! Jeff Lange Remembers: Disneyland Holiday Classics, Jeff Lange Experiences: Epcot’s Holiday Traditions, Jeff Lange Remembers Walt Disney World Holiday Classics, Jeff Lange’s Holiday Treat 06 and Jeff Lange’s Holiday Treat 07.